Greater Wellington Regional Council and Resene have formed a partnership to educate households to avoid tipping paint or paint washing water in stormwater drains. "We're saying to householders, you've made your home look beautiful, but don't ruin the homes of others. Your paint and washing water can poison the water where fish and other creatures live," said Margaret Shields, Chairperson of Greater Wellington. "Many people don't realise that stormwater drains are designed for rainwater only. Stormwater flows largely untreated into our streams, rivers and out to sea." 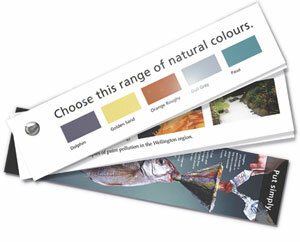 Greater Wellington and Resene have placed an innovative 'paint swatch' brochure in the Greater Wellington Resene ColorShops encouraging households to clean paintbrushes in the laundry sink or in a bucket that is tipped on the garden. Be the Difference is Greater Wellington Regional Council's programme to involve individuals and households in protecting the environment by taking personal responsibility for their actions. Be the Difference members will receive information packs three times a year, giving advice and tips on how they can protect our environment and live a more sustainable lifestyle. Over 5500 residents joined the programme within 4 weeks of launch. Residents can join Be the Difference by completing a sign-up form available from the Greater Wellington Regional Council.